How to Wear Jewelry Creatively. Here are some tips on how to wear jewelry creatively. 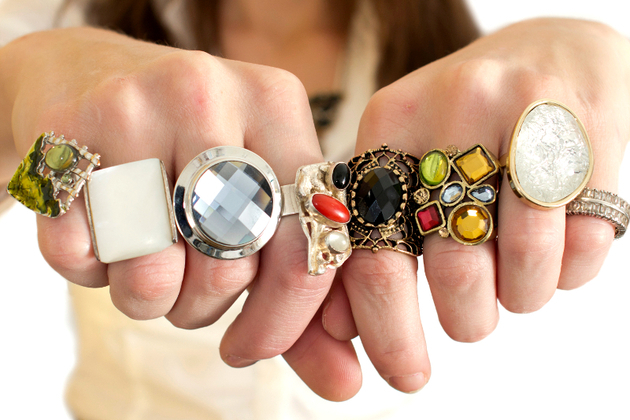 Wear your rings, necklaces and pendants in unconventional ways to be more original and artsy. Why fall into monotony and and why not figure out ways on how to wear jewelry creatively. Try to revive your old accessories with giving them new roles in completing your look. Read these tips to wear jewelry creatively. Believe it or not, a simple and classy ring can accessorize beautifully. Don't restrict yourself to wearing it on your fingers only. There are other creative ways to wear it - sure your saw especially old folks who wear their rings on necklaces. It's a really versatile way of combining two stylish jewelries. If you have a beautiful gold or silver necklace without a pendant, why not transform your ring into one. An elegant - or even the contrary - fantasy ring - can look very fashionable and funky. Braided hairstyles can also look amazing if you decorate them with rings. People with dreadlocks practice this more often.Pull a strand through the ring, place it close to your scalp and embed it into a classy, formal or extravagant hairstyle. Your hairdo will certainly grab attention! Necklaces are also versatile jewelry pieces. Wear these around your neck if your a conservative chick but, combine some patterns, make it flapper or doubled, twisted, knotted or lariat. These add the finishing touch to an outfit. Wear necklaces as bracelets, triple it and pair it with a casual outfit. If you are a fashion-forward girl you might create some real eye-popping outfits - the secret is to find the right color combos. A beautiful but pretty simple necklace can be transformed into a bling with a nice pendant. Some like it glamorous some low-key. A pendant can have endless functions when it comes of pulling off an oh-so-fabulous outfit. Besides wearing it on your necklace you can upgrade your simple hoop earrings with a nice pendant. Be careful don't wear them as earrings if they're way too heavy - these might pull your ears and and it's pretty painful. Choose light pieces instead and bring the best out of your 'bling'. If you are the proud owner of a charm or a Rolo bracelet you can attach the pendant to it. Use a simple jump ring, this way you can use your creative skills and make new jewelry yourself. Find pendants that mean much to you, a nice figurine can reflect your personality.